What happens when business students, design students, technical and non-technical students get together? You get a weekend of immense productivity, creativity, and entrepreneurship. Welcome to the first Startup Weekend uOttawa, an event where ideas form into a business reality. The weekend started off on Friday, February 27th with pitches from students that wanted their idea to be heard. Based on popularity, the top 8 ideas were chosen and teams organically formed around them. My pitch for Give-Back was chosen as one of the top ideas, so a team formed together to make it happen. The next 54 hours were devoted to creating, designing, coding, and validating the idea in the market to prepare the product for a pitch to the judges. 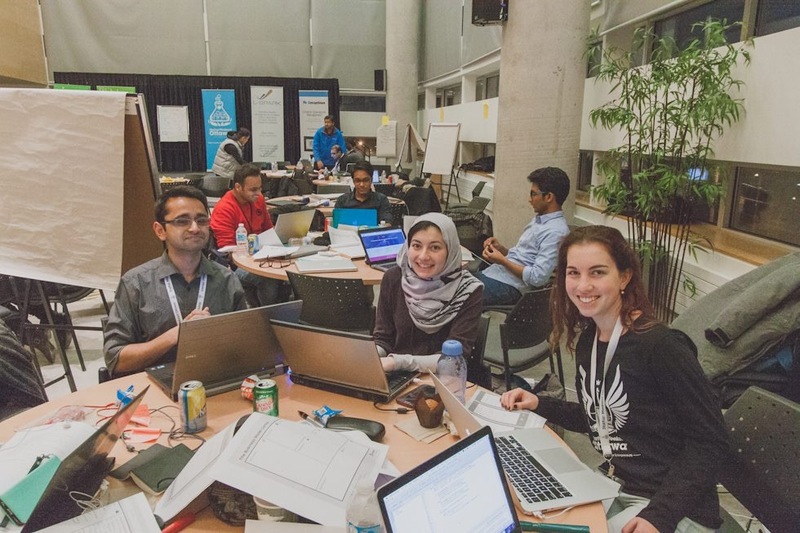 The days were filled with high energy, as teams coded their websites or mobile applications, while others rushed around Ottawa to gain endorsements from potential users of their ideas. Michael Lachapelle, Founder of Business Model Fulcrum, gave a phenomenal talk to the entire group that motivated the teams and provided some key advice. “What value are you creating? The customer’s pain is the only thing that matters,” said Lachapelle. That Sunday evening, pitches began, with 5 minutes to pitch the idea and 5 minutes to answer questions from the judges. The judges included Susan Richards, Casual CFO and Co-Founder of Givopoly, Code Cubitt, Founder and Managing Director at Mistral Venture Partners, Jeff Parks, Senior Management Consultant, and Tracey Clark, President & CEO of Bridgehead Coffee, who judged the pitches based on validation, execution and design, as well as business model. “Solve 90% of the problem for 10% of the market, not 10% of the problem for 90% of the market,” advised Code Cubitt. In the end, BestYums scored the appetite of the judges with an application that shows the best rated meal items at restaurants. BestYums helps you find the best version of your favourite meal item at restaurants. SocialTree allows you to filter your social media in one place. Class Magnet is a seamless student collaboration tool that can be used in classrooms. RecruitMe helps you score the best gig with startups that are looking to hire. GiveBack creates a fun way to raise awareness for the causes you care about. All in all, it was an incredible experience. I was able to learn new things, and meet some driven individuals who share my passion in startups and entrepreneurship. Keep an eye out for Give-Back.